Readers of the NZ Herald in September 1922 would have probably been quite intrigued to read of the passing of someone in the Borough of Avondale who appeared to have a distinguished set of links to our past. Mr. William Cook in whom was centred a most interesting link with the earlier history of New Zealand, passed away at Avondale to-day, at the age of 97. Mr. Cook was a grandson of the youngest brother of Captain James Cook, the great navigator, and his mother was a sister of Sir George Bowen, who was Governor of New Zealand from 1868 until 1878. Mr Cook was born near Portsmouth, England. From his early boyhood he wished to be a soldier, and while still in his teens he joined the volunteers. This did not prove exciting enough, and he went to Ireland and joined the 47th Regiment in Richmond Barracks, Dublin. While there the Crimean War broke out, and young Cook exchanged into the 13th Regiment, which was ordered for active service. A period of training with the regiment at Colchester followed, and arriving at last at the Crimea, Mr. Cook had a year and eleven months of an existence which could hardly be called life. Speaking in after years of the unsatisfactory conditions that existed during that strenuous time, Mr. Cook stated that so inadequate were the arrangements that he and many of his fellow-soldiers went a full twelve months without a change of clothing. It was not until after the arrival of Miss Florence Nightingale that matters were put on a better footing. Mr. Cook frequently came into contact with Miss Nightingale, and he always retained a kindly remembrance of the change that her arrival brought to the soldiers. While he was still in the Crimea, the news was received of the outbreak of the Indian Mutiny. Though the siege of Sebastapol had not yet been effective, troops were rushed from the Crimea to India, among them being Mr Cook. His regiment landed at Karachi, and from there they journeyed up the Indus to Mooltan, a distance of over 1300 miles, in flat-bottomed boats, which often stuck on mudbanks. On arriving at Mooltan, they disembarked and marched to Lahore, where fighting was proceeding, Lahore is. 900 miles from Mooltan, and the greater part of the route was covered with dense jungle; through which the soldiers had to cut their way. They often had to fight for their lives, as the Sepoys were constantly on their tracks. Mr. Cook was stationed in India for three and a half years, when trouble having broken out with the Maoris in New Zealand, his regiment (the 70th) was ordered to embark for Auckland. That voyage Mr. Cook never forgot. India had not been left far behind when cholera broke out on the ship. The crew numbered 18 all told, and a shipwrecked crew of a similar number was picked up near the southern coast of India. So virulent did the epidemic become that on arrival at Auckland there were only two of the combined crews of 36 alive, and in addition 200 of the soldiers died. The captain and first mate of the ship early succumbed, and the only persons on board with a knowledge of navigation were the boatswain and his mate. Some of the soldiers were told off to do duty as sailors, among them being Mr. Cook, and he was wont to relate with pride that on his arrival at Auckland he was given £3 10s extra pay for his work as a seaman. The trouble with the Maoris was steadily coming to a head, and the 70th Regiment was marched from Auckland to Drury, stopping on the way for a while at Otahuhu. The Great South Road from Drury to Mercer was constructed by the regiment, and various other public works were undertaken. In 1863 the regiment saw plenty of active service, especially near Shepherd's Bush. In 1865, when the war had ended, Mr. Cook left the army and received a grant of 60 acres of land at Whangarei for his services. He bought an adjoining block of ten acres for 10s an acre, and intended to take up farming for a change. However, his plans were changed. Contracts were let by the Provincial Government for railway construction works, and Mr Cook entered into partnership with Messrs Dawson and Elliot, and undertook the construction of the railway from the Parnell tunnel to Penrose. The first engine was sent from England in parts, and Mr. Cook assisted to assemble it at Newmarket. Unfortunately, however, Mr Cook lost £400 on the contract, and as [the] Provincial Government …was short of funds, there was no chance to recoup himself by entering on another railway contract. Mr Cook afterwards entered into the employment of the late Mr. Alfred Buckland, senr., and remained with him until early in the seventies. 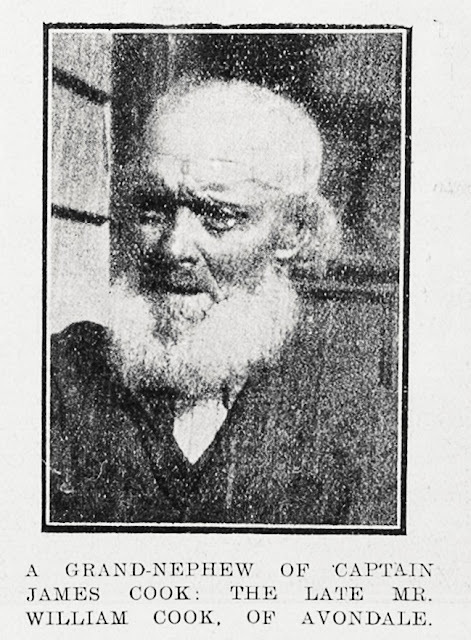 Mr Cook, ever a man of many parts, subsequently engaged as a quarrying contractor, and he often stated with pride that he personally quarried many of the stones used in the construction of the original Bank of New Zealand, the Bank of Australasia, and the Bank of New South Wales, and also for the Shortland street Post Office and the Supreme Court. Road contracts were afterwards taken up, and among the streets constructed by Mr. Cook was a large portion of the Manukau road between Parnell and Remuera. Mr Cook, who had been a widower for some years, leaves a large number of descendants. He enjoyed good health until two or three months ago. Well, unfortunately in terms with this stirring tale of British Empire and the colony's development, all was not what it seemed. Received 27th September, SYDNEY, This Day. Mr. James Watson, Research Secretary of the Royal Australian Historical Society, in a letter to the "Morning Herald," referring to the recent New Zealand cable message reporting the death of William Cook, grand-nephew of Captain Cook, aged 97, says:”As to the relationship claimed, it is extremely doubtful and quite unknown to any of Captain Cook's biographers. Captain. Cook himself had no descendants of the second generation, nor to his only brother John—born 1727, died 1750—can any son be traced, nor does it seem at all probable, calculating from these dates, that such a relationship existed." Watson was correct, as can be seen from this family tree. Captain Cook had two brothers -- John, older than him, who had no issue, and William, younger than him, who died at the age of three. The William Cook living in Avondale at the time of his death couldn't have been a descendant from one of Captain James Cook's brothers. His other claim to have familial connections with Sir George Bowen, I am unable to confirm at the moment. If William Cook had a large number of descendants when he died -- I wonder how many of those still living think or have thought that they, too, had a link back to the Endeavour? From what I have regarding the late Mr. Cook, it would seem he could teach us all lessons on taking things for granted, such as good health, clean clothes and decent food just to name a few. I must apologize that I haven't been coming around as much as when I first began blogging and you and I became correspondents. I realize you'd be the first to say "I understand, Bill", and I appreciate that, but it remains that these past few years have (in my estimation) been all about me, and I wish I weren't so selfish. Thanks, however, for not forgetting about your ol' pal Quasi and reading WTB? when you can. ahhh debunking family stories :-) I did that. Elderly members of our family for years thought we were related to Lord Kitchener .... we aren't..... GGG grandma Sarah's maiden name was Kitchener and that's about it LOL....It's not uncommon. However on saying that, Kitchener's mother Frances nee Chevallier bore an uncanny resemblance to my Sarah Kitchener, but of course - no connection at all. I agree with you Sandy. For years my family thought they were related to Capt Cook, through that same article published above. None of the old rellies are alive now, so they went to their grave believing! I am a descendant of this William Cook and I totally agree he can not be related via brother of Captain Cook. From what I have been told growing up this was a man of integrity and I have been able to prove his military career,so do wonder if there is something to the rest of the story. My theory is maybe his descent is from the brother of James Cook (the Captains father and not the Catain). With them both having the name James this could easily have been mistaken for the famous captain by either family or reporters. If anyone can shed any more light on this matter I would love to hear from you. At the moment, there seems to be no record found of any uncles or aunts for Captain Cook. John Cooke, father of James, father of James, has only one son known, which is unusual for the late 17th century. I wish you all the best with your hunt, Rose. Do pop back and let us know how you get on.